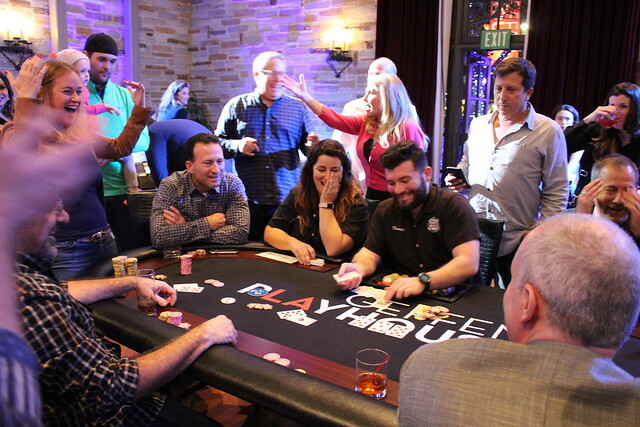 Ante up for a deep-stack, no-limit hold'em tournament benefiting the Geffen Playhouse! Each player may bring one guest and everyone can enjoy an open bar, day-long food service including sushi from Sugarfish and pub grub from HiHo Cheeseburger, as well as complimentary massages and manicures. Registration begins at 3:30 PM. Cards Fly at 4:30 PM sharp! Late arrivals and alternates will be seated during the first 3 levels. Players who bust out in the first 3 levels may re-enter as an alternate. One table (nine seats) at the Poker Tournament. Food service and open bar all day. View pictures from the 2018 event. The Geffen Playhouse (Federal Tax ID Number 95-4492653) and Determined to Succeed (95-4302067) are 501 (c) (3) non profit organizations. Information card on file with the City of Los Angeles Charitable Services 213.978.1144. Your donation will be 85% tax deductible. Availability is limited and poker tournament participation is on a first-reserved basis. Attendees must be 21 and over. Array ( [yt_video_id] => [subscribe] => 0 [tbd] => 0 [rsvp] => [subject_line] => [post_header] => [pre_header] => Judith & Bruce Stern and Adi & Jerry Greenberg invite you to [title] => 10th Annual Playing for Good Poker Tournament [image] => _px/_posters/1546627723_info_image_AllIn2019-206x270.jpg [content] => Ante up for a deep-stack, no-limit hold'em tournament benefiting the Geffen Playhouse! Each player may bring one guest and everyone can enjoy an open bar, day-long food service including sushi from Sugarfish and pub grub from HiHo Cheeseburger, as well as complimentary massages and manicures.